This is my submission to Deb for this week’s Souper Sundays and to My Legume Love Affair. Adapted from The 30 Minute Vegan Soup’s On! 1. If making the plantain chips, see below. Start by preheating your oven at 375F. Prepare your plantain chips and start baking them before you begin the soup. 2. In a large soup pot over medium heat, add oil. Once hot, add onion and saute for 3 minutes until softened. Add garlic, cumin and chile flakes and stir until fragrant, around 1 minute. Deglaze with the vegetable broth. 3. Stir in the black beans and carrot. Cover and bring to a boil by turning heat to high. Once boiling, reduce heat and simmer for 15 minutes. Add bell pepper and corn and cook 5 minutes more. Add orange zest, orange juice, salt to taste, and a dash of smoked paprika and liquid smoke. Simmer for 5 minutes more. Stir in a portion of the cilantro. Top with fresh cilantro prior to serving. 1. Preheat oven to 375F. Place all ingredients in a large bowl and stir to make sure all the sauce coats each slice of plantain. Transfer to a silpat-lined (or well greased) baking tray and lay in a single layer. Bake until golden brown, flipping after 6 minutes. (Mark suggests this will take only 10 minutes, but I needed 20-22 minutes, and bumped the temperature up to 400F). Carefully remove from the baking tray after they cool slightly. Makes ~1 cup plantain chips. What a great looking bowl of soup! Looking at the table of contents, it appears to be just one of many. I think my first soup to cook up would be the Irish Cabbage and Potato soup. Yum! This meal looks and sounds terrific! I’ve never seen this author; if this recipe is any indication, I’ve been really missing something! Thanks for posting, and thanks to the publisher for allowing this giveaway. I’m all for your own drum! I almost made bean soup last night, but opted for chicken. This is clearly a sign I need to bean it up next. Maybe with some kabocha chips? It’s so cold a rainy I could eat soup every meal! I haven’t tried any of their recipes yet! I’d like to try the red bean & rice soup. Gotta love beans and rice. Thank you, for offering the giveaway! I’ve not made any of Mark’s recipes but I am definitely going to look up his book. I would love to make the Spicy Kale Soup with Pepitas. Yum! I would like to try the Greek Lentil Soup. 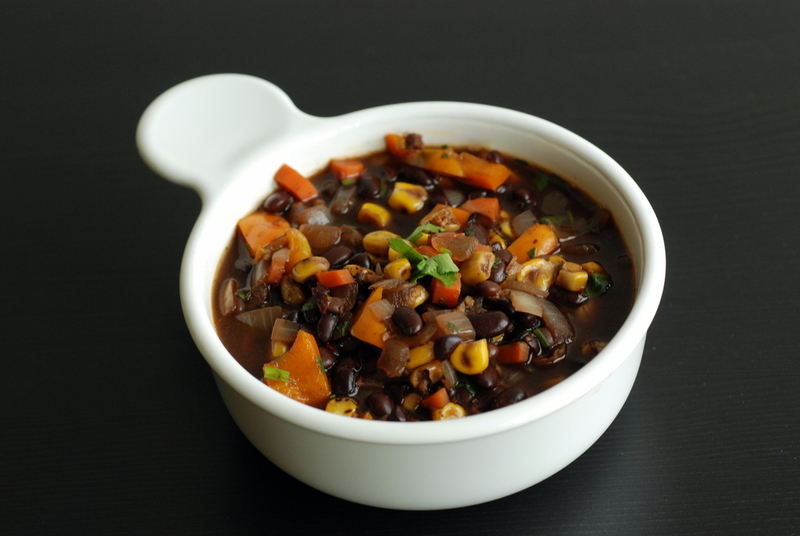 Your black bean soup looks great! Rancho Gordo beans are the best. I’ve not made any of Mark’s recipes but that black bean soup sure sounds good and I took a look at his book and I’d love to try the Fried Green Tomato Au Gratin Soup as I love fried green tomatos and in a sound sounds delightful. As a confirmed Vegan, this soup looks fabulous! And with RG beans, it must be even better. I definitely want to try BLACK BEAN TOMATO SOUP WITH POLENTA DUMPLINGS and THREE SISTERS SOUP! This cookbook looks fabulous. I’ve been on some major soup kicks lately, so this is being added to the menu! Love the plantain infusion…at least that will make me feel like I’m in the tropics. I’m not very familiar with this author, but I’m intrigued by this book. I really love to make soup and I make it every week during the winter. I think the Miso Soup with Pickled Ginger Soup and the Roasted Brussels Sprouts and Red Cabbage Soup sound perfect for cold weather! I like the orange beet soup. I’m a big fan of soup! I haven’t made any of his recipes, but I would have to try the Cheesy Cauliflower soup first! I have not tried any of Mark’s recipes yet but they sure sound good. I would love to try the African peanut soup first then make my way through the book. Thanks for a great giveaway. Wow, you really sold me on that book!! Sounds fantastic. Making soup in under 30 minutes is a huge plus because I never want to wait hours for it to simmer. I’ve never tried making Thai soup, but that Thai coconut vegetable soup sounds SO good!!!! This soup looks amazing and so does the Mideast Chickpea soup! I’ll go with the grilled eggplant soup with pine nuts. It sounds delicious *and* different! I think the grilled eggplant soup with pine nuts looks so interesting and that is what I’d want to try first! A couple of people recently have told me they don’t like soup! It’s just something I can’t imagine! This one looks great and I’ll have to try plantains baked. I can’t get them where I am now unfortunately but I used to always just sauté them in coconut oil. Delicious. Mmmm this soup looks so hearty & delicious. I love the idea of the plantain chips too!!! I have never made them before. I’d love to try the red beans and rice soup! I haven’t made any of his recipes before, but I love the table of contents for the new book! He has some very exotic sounding soups (and I’m a soup junkie! ), but believe it or not – it’s the French Onion one I’m most anxious to try. It was my favorite soup as a kid, and I haven’t had one in nearly 10 years. I’d love to have a vegan re-creation of a childhood fav! 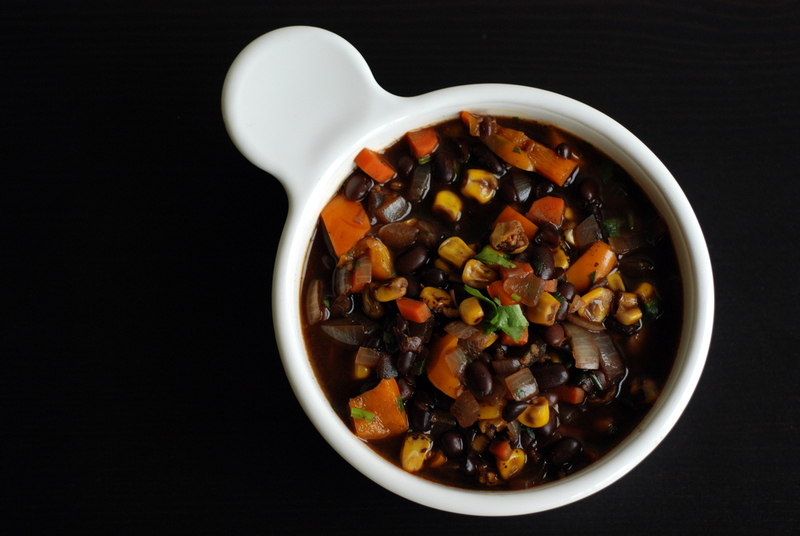 Black bean soups are some of my favorites–I especially like the smokey flavors in this one with the brightness of the orange. Yum! Thanks for sharing it with Souper Sundays this week. The coconut carrot soup with ginger and dill. Man oh man does that sound amazing!! I love soup ALL YEAR! I would love to try the Mideast Chickpea Soup….sounds yummy! The soup looks very nice: I like the combination of flavors. I don’t use black beans very much, but I should change that. Thank you so much for contributing to MLLA. And Happy New Year!